To the east of him is a rock which has an Escape Rope hidden in it. Now head south and enter the building. If you go right through you find that Snorlax blocks your path. Go back inside the building and head upstairs. On the left side of the room is Prof. Oak's Aide. Head back to Vermilion and heal if need be. While in the Pokecenter be sure to grab your spare Abra from the PC. 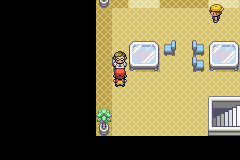 Now head back onto Route 11 and enter the cave at the start. 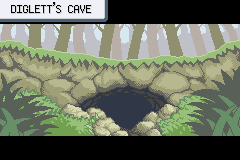 This is Diglett's Cave. When you enter head down the ladder. There are only Diglett and the odd Dugtrio in here, so catch one as you progress through to the other end. Dugtrio have the Arena Trap ability which traps Pokemon and prevents escaping. Dugtrio is a pretty good Pokemon to catch for this stage in the game. Head up the ladder when you get to the other side and exit the cave. You will notice you are in the area near Pewter City which you couldn't access before. Use Cut on the tree to the left and head north toward Pewter City. Continue to the north up to the museum in Pewter. Head to the right and you will see a house to the side. Cut the tree which blocks entry to this house and go inside. Talk to the scientist directly in front of you (at the top of the room) and he will give you Old Amber. This will later be cloned to form Aerodactyl. Exit this room and head back south to the tree you cut near Diglett's Cave. Enter this area again and now head south. Go inside the first house and talk to the boy on the far side of the room. He will trade his Mr. Mime for your Abra. Exit this house and continue south, cutting the tree and going to the next house south. Inside this house is Prof. Oak's Aide. Talk to him and if you have caught 10 or more Pokemon he will give you HM05 - Flash. Exit south and head down to find an Ether. Continue south and you'll find a Paralyz Heal. You can use Cut by the bush here to get to Viridian City but there isn't anything to do there. Instead, head north back through the building, back through Diglett's Cave and back to Vermilion City. Heal here if needed. Now head north from Vermilion, back up Route 6, go through the underground tunnel north, back up Route 5 all the way back to Cerulean City. Now exchange your Bike Voucher at the Bike shop for a Bicycle. 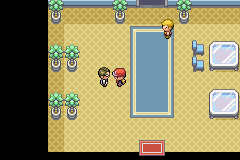 Now head back through the robbed house, follow the yellow path and when you get to Cerulean Gym head east. Cut the small bush and head onto Route 9. If you want to heal up at this point don't go racing back to Cerulean as there is a Pokemon Center just around the corner and no more battles. Return to where the Picnicker above is. From here head right onto Route 10. Only Voltorb which are new here. Note the water up the top, this is where you Surf from to get to the Power Plant later in the game. 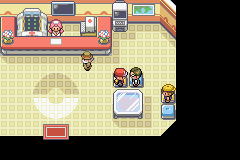 At this PokeCenter be sure to heal up. Talk to Prof. Oak's Aide also, and if you have 20 Pokemon or more he will give you an Everstone which will stop your Pokemon from evolving when held.